Henna mandalas are part of the ancient tradition of mehndi still practiced today in parts of the Middle East, Africa and India. Henna is also popular with the general public as a temporary tattoo method and a way to decorate the body during pregnancy or other special occassions. The art of mehndi and henna tattoos has been around for at least the last 5,000 years, but some scholars believe the tradition can be traced back even further, going as far as 9,000 years. Ancient cultures started applying henna to the hands and feet as a way to cool down the body. 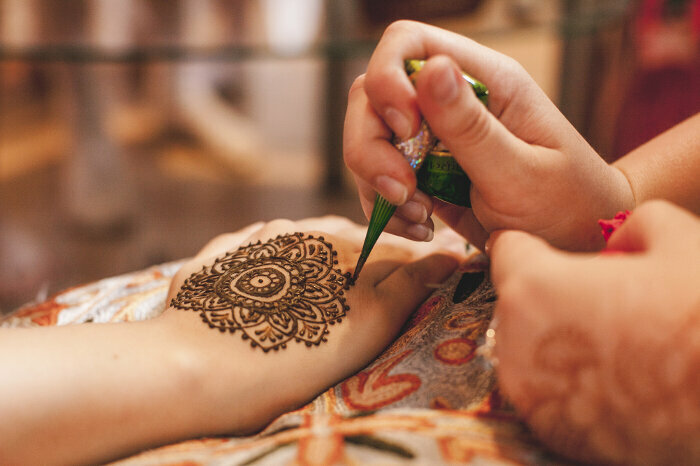 Historians believe that when people became aware of the staining left behind from using henna, the idea to start putting it on in patterns and designs was born. 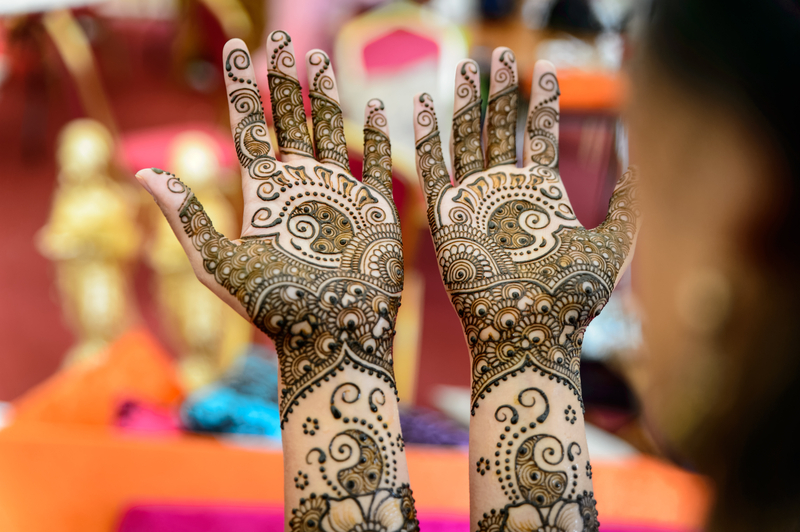 Today, mehndi remains a very important part of important ceremonies and celebrations — including holidays, weddings and birthdays — for traditional cultures, and the practice has also become popular as a tool of self-expression in the West. While mehndi includes the entire scope of designs, mandalas and script that is painted on the body using henna, mandalas have a special significance in this tradition. Mandalas are ornate circles believed to represent wholeness, well-being and a connection between people and the rest of the universe. Perhaps the most famous and well-recognized mandalas are those created by Tibetan monks. The monks create complicated geometric designs within the circles, often with colored sand on the ground or with paint on the walls and floors, while chanting and meditating. After the mandala is complete, the monks sweep it up and poor water over the sand grains as a way to memorialize the impermanence of existence. Traditionally, the henna used in mehndi is made from the dried and powdered leaves of the henna plant. The color left behind after the henna has dried and flaked off is usually light brown with orange or reddish tones. Premixed and ready-to-use henna is available online and at many craft supply stores, but it’s important to make sure you’re getting natural henna. If the henna is very smooth in texture or a color other than brown, you may have something more along the lines of a temporary tattoo paint. Once you have your henna, try looking at mandala patterns for inspiration. Once you have an idea of what you like and how to successfully apply henna, it’s easy to start creating your own designs. There are no rules or right or wrong way to create your mandala. However, it’s easier to start at the center and work outward until you reach the size and style you’re looking for. The longer you leave the henna on the skin, the darker the stain will be. Keeping the henna moist for the first day or so also helps, and some artists recommend spraying the design with a mixture of sugar, lemon and water or keeping it warm for the first few hours. Real henna applied correctly — make sure to let it dry and flake off naturally and avoid getting the area wet for at least 24 hours after the paste is gone — can be expected to last a couple of weeks on average.